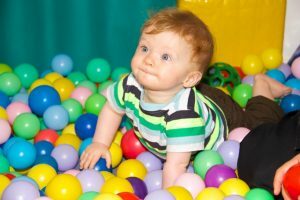 Our baby unit consists of two playrooms (one including a ball pool), a newly fitted kitchen, baby change room and separate sleeping room. The staff ratio in this room is 1:3. Each baby is given lots of tender loving care by qualified nursery nurses at all times. Individual feeding and sleeping patterns, which have already been established by the baby’s parents, are adhered to. Physical and mental development is encouraged with one-to-one attention. Each baby has his/her own progress file with photographs and notes on their development. Detailed liaison between parents and the Nursery Nurse caring for their baby is a two-way communication, which takes place daily. Daily ‘tick sheets’ are also available. Stimulating toys, books, mobiles, pictures and music are used to encourage the babies’ development. Each child receives personal encouragement to become more independent and to develop their understanding of colours and shapes. The children each have a folder containing details of their progress and photos of them in action are updated continually. Folders are available for viewing at any time. Social skills such as learning to share and interacting with others, are fostered at this stage. The children are also encouraged to begin feeding themselves. Daily activities include: baking, sticking, painting, singing, dancing, floor puzzles, construction toys, sand & water, imaginative play and much more. Plenty of outdoor activities take place at different times during the day.